Smartphone addiction is changing our brains and bodies. It’s a fact. 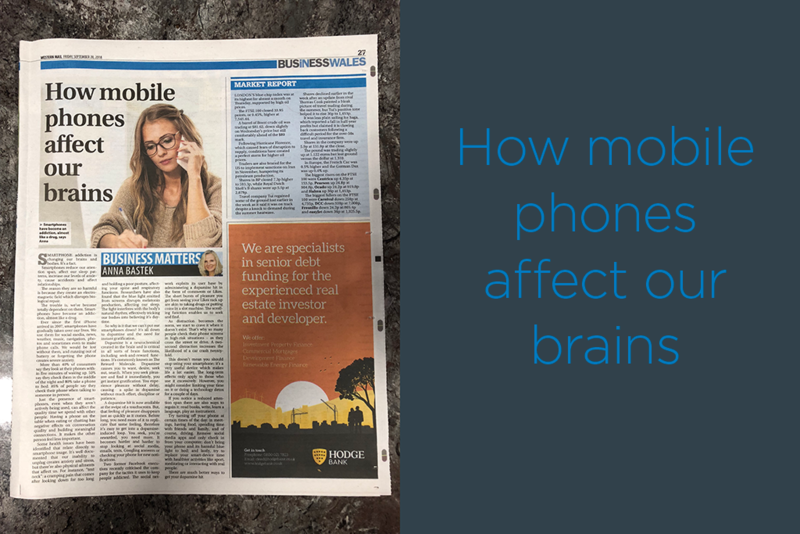 Smartphones reduce our attention span, affect our sleep patterns, increase our levels of anxiety, cause accidents and affect relationships. The reason they are so harmful is because they create an electromagnetic field which disrupts biological repair. The trouble is, we’ve become totally dependent on them. Smartphones have become an addiction, almost like a drug. Ever since the first iPhone arrived in 2007, smartphones have gradually taken over our lives. We use them for social media, news, weather, music, navigation, photos and sometimes even to make phone calls. We would be lost without them, and running out of battery or forgetting the phone creates severe anxiety. More than 40% of consumers say they look at their phones within five minutes of waking up. 50% say they check them in the middle of the night and 80% take a phone to bed. 85% of people say they check their phone when talking to someone in person. Just the presence of smartphones, even when they aren’t actively being used, can affect the quality time we spend with other people. Having a phone on the table when eating or chatting has negative effects on conversation quality and building meaningful connections. It makes the other person feel less important. Some health issues have been identified that relate directly to smartphone usage. It’s well documented that our inability to unplug creates anxiety and stress, but there are also physical ailments that affect us. For instance, “text neck”: a cramping pain that comes after looking down for too long and holding a poor posture, affecting your spine and respiratory functions. Researchers have also found that the blue light emitted from screens disrupts melatonin production, affecting our sleep. The light interferes with the body’s natural rhythm, effectively tricking our bodies into believing it’s daytime. So why is it that we can’t put our smartphones down? It’s all down to dopamine and the need for instant gratification. Dopamine is a neurochemical created in the brain and is critical in all sorts of brain functions, including seek-and-reward functions. It’s commonly known as The Reward Molecule. Dopamine causes you to want, desire, seek out, search. When you seek pleasure and find it immediately, you get instant gratification. You experience pleasure without delay, causing a spike in dopamine without much effort, discipline or patience. A dopamine hit is now available at the swipe of a touchscreen. But, that feeling of pleasure disappears just as quickly as it comes. Before long, you need more of it to replicate that same feeling, therefore it’s easy to get into a dopamine-induced loop. You seek, you’re rewarded, you need more. It becomes harder and harder to stop looking at social media, emails, texts, Googling answers or checking your phone for new notifications. Two former Facebook executives recently criticised the company for the tactics it uses to keep people addicted. The social network exploits its user base by administering a dopamine hit in the form of comments or Likes. The short bursts of pleasure you get from seeing your Likes rack up are akin to taking drugs or putting coins in a slot machine. The scrolling function enables us to seek and find. As distraction becomes the norm, we start to crave it when it doesn’t exist. That’s why so many people check their phone screens in high-risk situations – as they cross the street or drive. A two-second distraction increases the likelihood of a car crash twenty-fold. This doesn’t mean you should stop using your smartphone; it’s a very useful device which makes life a lot easier. The long-term effects only apply to those who us it excessively. However, you might consider limiting your time on it or doing a technology detox for a couple of days. If you notice a reduced attention span there are also ways to regain it: read books, write, learn a language, play an instrument. Try turning off your phone at certain times of the day: in meetings, having food, spending time with friends and family, and of course, driving. Remove social media apps and only check in from your computer; don’t bring your phone and its harmful blue light to bed; and lastly, try to replace your smart-device time with healthier activities like sport, meditating or interacting with real people. There are much better ways to get your dopamine hit.